The internet can be a great way to stay connected to those you love, but a single post can turn into the source of jealousy that incites a person to do the unthinkable. 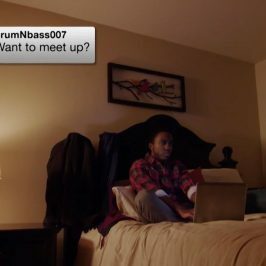 #Murder explores stories of social media gone horribly wrong. To reap the benefits of socialising and making new friends, teens often disclose information about themselves that would typically be part of an acceptable “getting-to-know-you” process offline (name, school, personal interests, etc.). On social network sites, this kind of information is now posted online—sometimes in full public view. Relationships that, in the past may have begun in the school yard, now begin online in social media. This was the tragic case of 14-year-old Shaniesha Forbes. Shaniesha Forbes, whose body was found washed up on a New York beach in January 2013 had a huge social network of friends on Facebook and, like so many teenagers today, had a social life firmly grounded in social media. Ultimately Christian Ferdinand, the older boyfriend whom she’d met through Facebook, was arrested four months later in Maine and confessed to the crime and showed that it is very easy to hide-in-plain-sight online. What we post about ourselves sometimes has no basis in reality. We can, not only hide behind a different visual image of ourselves – but what we say can convey a vastly different impression of who we are. When investigating the disappearance and tragic and untimely death of Shaniesha Forbes, police worked very closely with the community. 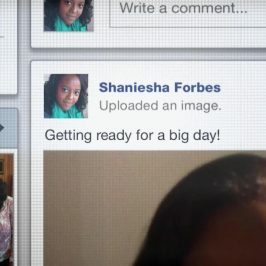 However, investigating detectives had the challenging task of determining the real identity of many of Shaniesha’s Facebook friends. Detective James Normille of the New York City Police Department explains. Christian Ferdinand was unsurprisingly hiding behind an online alias, but once detectives were able to determine his real identity, and ask Shaniesha’s friends and associates about boyfriends, the detectives started to hear some disturbing information about Ferdinand. Most of the time, what we put up on social media is innocuous – whether it’s true or not. This was also the case in the earlier days of social media. If you were a tech-savvy, young internet user in the 2000s you probably had a Myspace account. It was quite a common interaction online and even in real life to ask someone if they were on Myspace and if they could be your friend. However, nowadays, many have not even heard of what was once one of the most popular websites on the internet. In 2006 it was the most visited website in the United States, even surpassing Google. The murder of Mikarah Sanders in 2009 came because of a jealous rage provoked by an innocuous Myspace post. Just after 9:30 p.m. King County sheriff’s deputies responded to a 911 call at an apartment on Ambaum Blvd. in Burien, Washington. The deputies were told that two people had been shot and that the gunman had fled the scene. Matthew Dubois had been shot in the shoulder and was conscious. Mikarah Sanders was found in Dubois’ bedroom, face down on a bed. She had been shot at close range in the left cheek with a handgun, which later was found under a stairway at the apartment complex. Tragically, Mikarah passed away at Harborview Medical Centre, Seattle, early the following morning. In an interview with detectives, Matthew Dubois said a man with a blue bandanna in his back pocket ran into the apartment, fired two shots and fled, according to the charging documents. The statement is an apparent reference to a South Seattle street gang aligned with the Crips, whose members typically wear blue. However, it was later revealed that it was not a member of the Crips that was responsible for the shooting. Dubois and his brother’s girlfriend told detectives someone else was responsible for the shooting, but she later admitted hearing Dubois and Sanders arguing over a comment Sanders’ ex-boyfriend had posted on Sanders’ MySpace page. This was followed by a single gunshot. She said she then watched Dubois shoot himself in the shoulder to make it appear he was a victim of gang violence. The tragic death of Mikarah Sanders resulted from a boy who was jealous and angry over a message another boy had posted on her MySpace page. What started as a Facebook spat among a group of Florida teens in 2014 became a first-degree murder case of a boy, prosecutors said was just sixteen when he shot and killed another sixteen-year-old. However, there were a lot of problems with witnesses and material evidence in the case against Samuel Turner, the boy accused of murdering Ivan Redding. Assistant State Attorneys Terri Skiles and Lauren Godden told jurors that at least four witnesses, including two of the victim’s sisters, identified Turner as the shooter. They said they overheard Turner ask a friend to get him his gun immediately after the Oct 18, 2014 fight and later saw Turner reach his arm into the backseat of a car Redding was sitting in to shoot him once in the chest. These are just three of the extraordinary and tragic cases which have resulted from feuding, misunderstanding and bullying on social media. Each one-hour episode of #Murder highlights the true story of a shocking homicide whose origins can be traced back to online activity. Combining atmospheric cinematography with stylish graphics adapted from the principal characters real-life digital footprints, #Murder demonstrates how even the most innocuous tweets, posts, and status updates can have deadly real-world consequences.